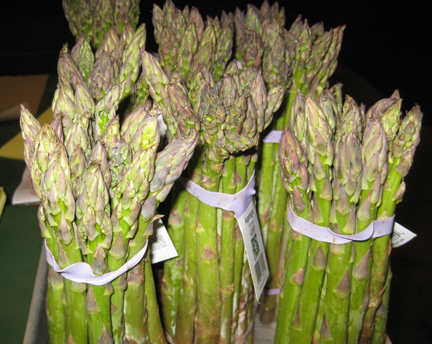 Asparagus is still sticking up happy stalks at local farm stands, which makes me ecstatic. I try to eat it every day, if only in a salad. I know it will go away all too soon. Naturally, I wanted to use it for my appearance last week on Mass Appeal. I wasn’t quite sure what to do with it—and then suddenly I had a vision of asparagus in the middle of a Croque Monsieur. Here’s how I made the sandwiches last week. To tell you the truth, I’m not sure the sandwich needs the béchamel (white) sauce. It would be pretty good with just a little extra cheese. But then, when does one ever NEED béchamel? It does make the sandwich just a bit more decadent and French, however. As I said on the air, a Tinky could conceive of grilled cheese with asparagus. It takes a French person to think of throwing béchamel on top. I have to admit that a French person might have been a bit more sparing than we were in the video below. P.S. You’ll note from the crumble video that I have now adopted the soubriquet “The Diva of Deliciousness.” This was suggested by Craig Hamilton, a delightful chef on the Jersey Shore. What do you think of the new name? In a saucepan over low heat melt the 2 tablespoons of butter. Whisk in the flour, and cook, whisking, for 2 minutes. Slowly whisk in the hot milk. Cook and whisk until the sauce thickens a bit, 2 to 3 minutes. Remove the sauce from the heat, and stir in the paprika and salt. Set aside. Begin assembling your sandwiches. Spread the slices of bread lightly with mustard. Top two of the slices with a slice of cheese, ham, asparagus, and another slice of cheese. Place the other slices of bread on top to make two full sandwiches. In a frying pan melt a small amount of butter. Pop the sandwiches into the pan and lightly brown them, adding a little more butter if needed. Put the sandwiches on a baking sheet. Top them with some of the sauce (you don’t have to use it all; I just like to make sure I’ll have enough!) and the shredded cheese. Broil them until they turn golden brown and bubbly. This entry was posted on Tuesday, June 14th, 2016 at 4:00 am	and is filed under Asparagus, Crisps and Crumbles, Rhubarb, Sandwiches, Strawberries. You can follow any responses to this entry through the RSS 2.0 feed. You can leave a response, or trackback from your own site. We’re with you and that Croque, Tinky! YUM! Yum indeed. Thank you for the solidarity…. It does seem to bring me back to Paris with the great taste of cheese, fresh bread and asparagus. 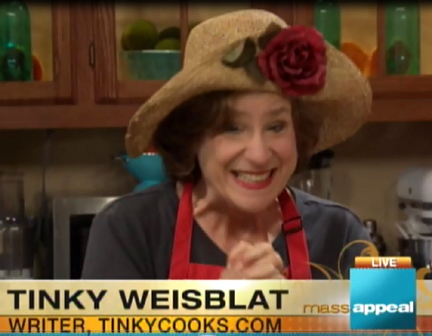 Thank you for the recipe and what a great tv appearance Tinky! Thank you, Sophie! We had fun as always.